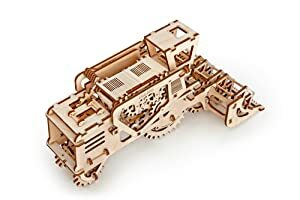 DIY COMBINE HARVESTER TOY is a top-to-bottom example of the wonders of mechanics. 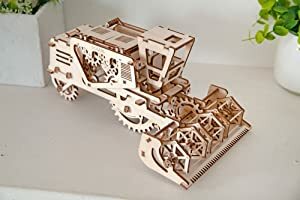 Drag the harvester backwards to wind up its rubber band motor. Release the hand brake lever and off you go to bring in the crops. You’ll see the cutter board reel at the front spin just like a real harvester, but what you won’t see is a hidden box to the left of the driver’s cabin for sending love notes to your favorite farmer. 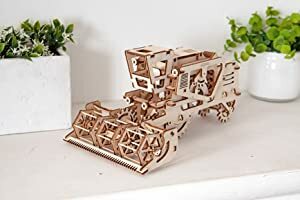 DIY COMBINE HARVESTER TOY is a model that offers a variety of mechanics. When driving the harvester, a reel starts spinning, as in the real prototype. 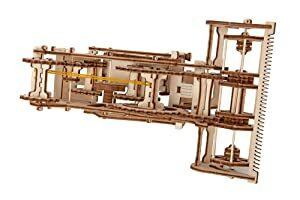 The model has a built secret box. It opens with a lever, located to the left of the cab. Our combine starts with a simple movement or spinning of the large back wheel. On the other side of the cabin there is a lever that can lock or run the harvester. Harvester works on rubber engine. 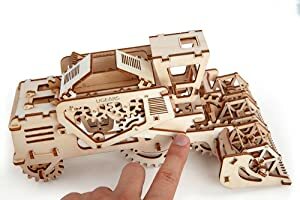 You need no glue to put COMBINE HARVESTER models together, which makes watching it working and moving even more exciting. You can assemble them at home on the table. All you need is your own hands, patience, and assembly instructions.